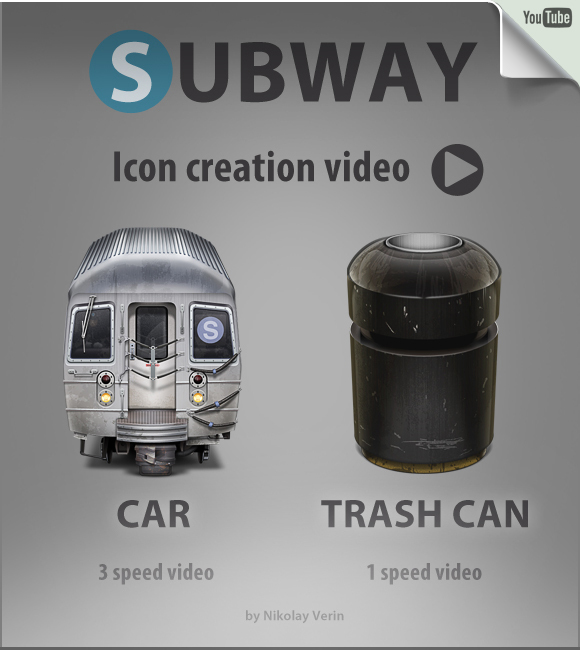 I just watched your subway icon creation on vimeo and I´m really impressed. This is kinda of video I searched for a long time and it really provides many insights on the icon creation topic. Well done & thanks for sharing your know-how! Nice! I really glad that you find this video interesting and helpful! You have strong patience if you watched it to end. he-he! don't be a scarry! all ok, it's normal work in PS lol. I always enjoy looking this kind of videos. I learnt a lot, thanks for that. Thanks and jus stay tuned! You'll see more vids about interesting features! it's amazing how you put those details in those icons. Really great idea for the video tutorials! And very impressive work! F***ing awesome! Man, you've got golden hands! And nice to see it as a speed vid. Didn't you want to make a tutorial for how to draw icons for Customizers a while ago? I'll feature this at our site, if that's ok.
Argh, tutorial. Yeah, I was planed it, but I tired wrote much words, made screenshots. Easy for me make a videos then write some tut. Then sorry about it. Ah, no problem, mate. Maybe another time. С Днем Рождения! Больше вдохновения и позитива в работе и жизни! those are the best speed videos that I ever saw, they made me a big fan of your work. Yeah you've told about it before and I'm glad that you so! Stunning icons and awesome to see how you did it! Keep it up, bro!! Thank you! And yeah, Be sure I will! Вот ты даёщь .. Сколько то лет практики у тебя ? художественное образование и 1.5 года задрачивания иконок. But yeah there is realy many scratches and rusts! He-he! "Stuned" is reaction what I need and sure thanl you Manuel! Cheers! How about a simple icon creation with normal speed I need it to learn about icon creation. thank so much! And yeah I've thinking about to do the "simple icon creation with normal speed"! So just stay tuned and all stuff are come! Eto prosto obaldenno! Ne dumal chto ti snachala risuesh! Vsio slishkom bistor. Trudno usledit. No, fantastika! A pochemy na DA ne sdelal upload? Аплоад чего я не сделал?? Видео или иконок? Da, voobshe kruto smotritsia! Prosto fantastika! Upload tutoriala, nu i ikonki toje bilo bi khorosho! А нечего заливать, релиз будет от IconBlock попозже. только вот эти видео как-то вот так все. Eto i est tutorial! Voobshe ia tochno ne znaiu, no pomoemy seichas mojno video roliki na DA zakachivat. Можно и на ДА закачивать, только во Flash Video, а это гемор. Oo, tolko v flash? Eto plokho. ha-ha! Thats the resul what I was wait!